Does market liquidity risk affect Euro corporate bond returns more seriously in stress periods? Wolfgang Aussenegg, Louisa Chen, Ranko Jelic and Dietmar Maringer. Investors require compensation for holding risky assets – an example is the bond liquidity premium for holding debt assets. In stress conditions, market liquidity can evaporate and lead to disorderly movements in prices. The Bank of England’s recent Financial Stability Report (p.29) documents a decline in the market liquidity of some government and corporate bonds, accompanied by a reduction in dealer activity. Does market liquidity risk affect bond returns more seriously in stress times than in normal times? Does a higher cost of funding for dealers in stress times cause bond returns to be more sensitive to liquidity shocks? Focusing on Euro-dominated investment-grade corporate bonds, we conduct a quantitative analysis in a regime-switching model, and confirm a ‘yes’ answer to both of these questions. Market liquidity refers to the ease with which an asset can be swiftly traded at close to the immediately-preceding price. Since it varies over time in an uncertain fashion, risk-averse investors will require compensation for being exposed to market liquidity risk. In normal times, market liquidity risk is low and hence the liquidity premium is small. However, market liquidity might suddenly ‘dry-up’ when markets become stressful. The collapses of LTCM in 1998 and Lehman Brothers in 2008 tell us how illiquidity can arise sharply and damage the entire market. Focusing on Euro-dominated investment-grade corporate bonds in 2000 – 2014, we use a regime-switching model to investigate whether the impact of market liquidity risk on bond excess returns differs in stress times and normal times, and whether funding illiquidity leads to market illiquidity when the market slides into stress conditions. We find that market liquidity risk reduces bond excess returns five times more in stress regimes than normal regimes. The market is prone to suffer stress and high market liquidity risk after funding liquidity becomes worse. An interpretation is that dealers’ funding constraints reduce their market making activity and hence market liquidity provision, resulting in a fall in bond returns. where is the excess return of corporate bond index in month t, calculated as the percentage price change less the monthly Euribor rate; is the market liquidity risk of corporate bond index; TERM and DEFRATE are variables controlling the term spread and default risk, so TERM is the difference between the return on the iBoxx 7-10 year German government bond index and the Euribor rate, and DEFRATE is the ratio of the number of defaulted issuers of (all) corporate bonds over the number of active companies in Euro-zone countries, plus the UK, Switzerland, Norway and Sweden; and are the regime-dependent estimates; is the residual with regime-dependent variance σεs. The one-month-ahead probability of the corporate bond market being in a stress regime (i.e. high σεs) is obtained after the estimation. We use a composite market liquidity measure for the corporate bond index, λ, developed in Aussenegg et al. (2016) p.11. The composite liquidity measure is constructed by combining two market liquidity measures within a principal component analysis, a statistical technique for extracting key information from multi-dimensioned datasets (See the Chart “Corporate Bond Liquidity Appears Ample” in Adrian et al. (2015) for an example of the use of principal component analysis). As such, it is the difference between the actual level of liquidity and level that could have been anticipated (based on its recent trend). Fig 1 below shows the composite market liquidity measure of the corporate bond index, where high value of λ refers to low market liquidity. The associated market liquidity risk, ARλ is plot in Fig 2. We analyse the Markit iBoxx investment-grade corporate bond index between January 2000 and December 2014, which includes 889 Euro-dominated corporate bonds. The Markit iBoxx data also include the required German 7-10 year government bond index, the Euribor rates and Libor-OIS spread (a proxy of funding liquidity). The data on default rates on European corporations is from Moody’s Analytics. The estimates of the Markov regime-switching model on the corporate bond index are presented in Table 1. Regimes 1 and 2 are respectively characterised by high and low volatility of the unpredictable part of bond excess returns, i.e. the standard deviation of the residuals in equation (1). High market liquidity risk (i.e. illiquidity shocks) significantly lower bond excess returns in both regimes, where the coefficients of ARλ for corporate index in regimes 1 and 2 are -0.75 and -0.15, respectively. Considering the sample’s standard deviation of ARλ is 0.76, this means a one standard deviation illiquidity shock could reduce monthly bond excess return by 0.57% (annualised 6.84%) in the stress regime and by 0.11% (annualised 1.37%) in the normal regime. As shown in 2), illiquidity shocks reduce bond excess returns much more in the stress regime (i.e. regime 1) than the normal regime (i.e. regime 2). Specifically, the estimated coefficient of ARλ of the corporate index in regime 1 is five times greater than that of in regime 2. In the corporate bond market, market liquidity is supported by dealers acting as market makers. Our result suggests that dealers might suffer funding constraints in stress times. It then becomes more costly for dealers to warehouse securities. This reduces liquidity provision to the market, resulting in a fall in bond excess returns. To further investigate whether a deterioration of dealers’ funding liquidity leads to a high market liquidity risk and low bond excess returns, we estimate the probability of being in low-funding-liquidity regime for the corporate bond market using another Markov regime-switching model. In this model, funding liquidity is proxied by the Libor-OIS spread, and the independent variable includes the constant only (see equation (2)). Hence, the constant refers to the ‘average’ funding liquidity that switches between high and low funding liquidity regimes. Similarly, we estimate the probability of being in high-market-liquidity-risk regime for the corporate bond market, where market liquidity risk is described above (see equation (3)). Fig. 3 plots the estimates of the probability of being in high-market-liquidity-risk regime, the probability of being in low-funding-liquidity regime, as well as the probability of being in bond-market-stress regime obtained in the estimation of equation (1). We can see that the market is inclined to encounter stress and high market liquidity risk after funding liquidity becomes worse. This finding supports our intrepration of Result (3) above. 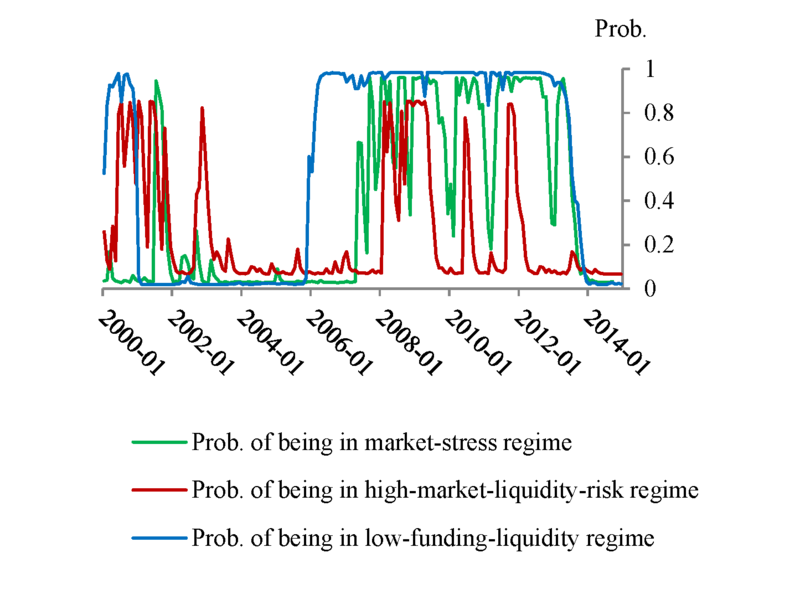 Fig 3: The probability of being in market-stress regime, the probability of being in low-funding-liquidity regime and the probability of being in high-market-liquidity-risk regime of Euro corporate bonds. Using a Markov regime-switching model, we find that market liquidity risk is indeed a pricing factor of corporate bonds. 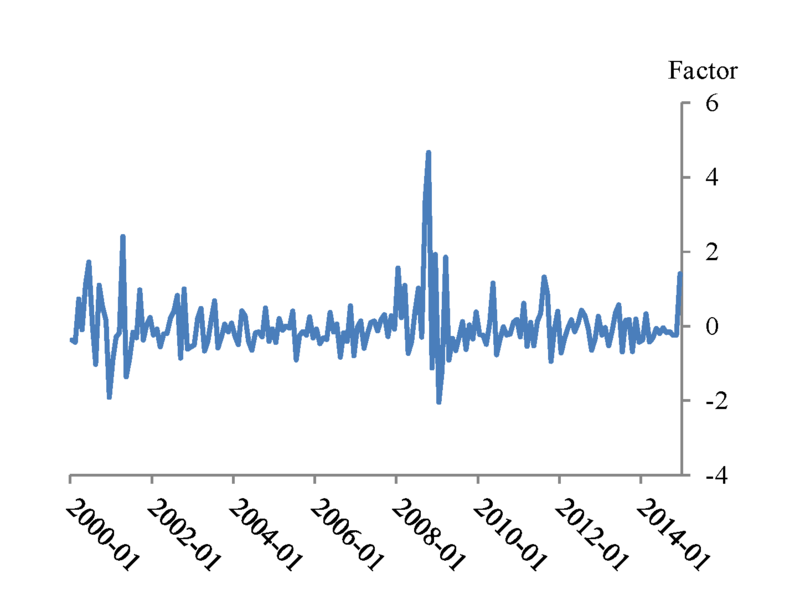 Negative liquidity shocks reduce bond excess returns. 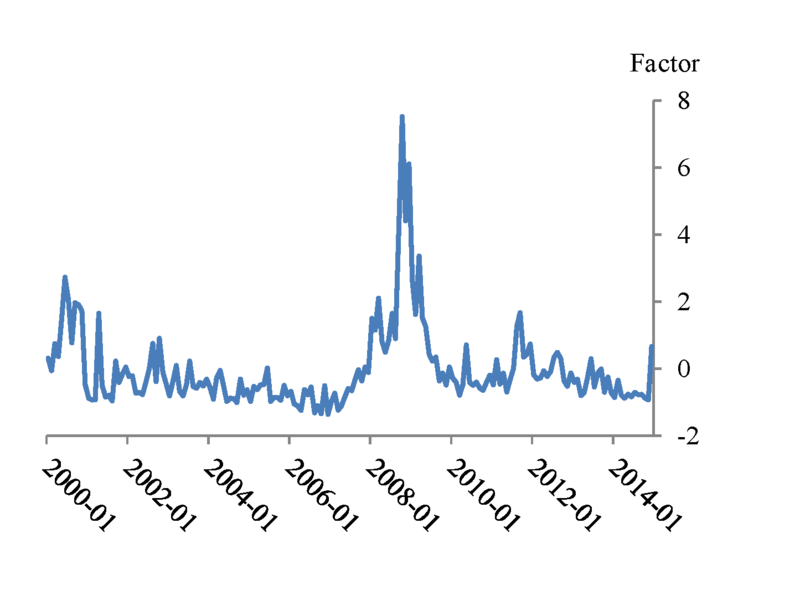 This effect is much stronger in market stress times than normal times, as deteriorating funding liquidity increases the consequences of market liquidity shocks. A high dealers’ funding constraint reduces their market making activity and hence market liquidity provision, resulting in a fall in bond excess returns. This post was written whilst Louisa Chen was working in the Bank’s Capital Markets Division. Wolfgang Aussenegg is Professor at the Vienna University of Technology, Ranko Jelic is Professor of Finance at the University of Sussex, Dietmar Maringer is Professor of Computational Economics and Finance at the University of Basel.